Dutch Games Association (DGA) was founded in 2008 in order to create a healthy climate for the Dutch games industry to grow, flourish and expand. As a sector organisation, we fulfil a wide variety of needs to Connect, Serve and Inspire the industry, in the Netherlands and abroad. DGA organises and attends relevant events and connects interested parties in order to stimulate business opportunities and general growth of the industry. Furthermore, we act as the voice to the government and international organisations on relevant subjects that are of concern to the Dutch games industry. Dutch Games Association actively maintains an extended network which consists of different influencers that allow us to innovate and grow as an industry. In order to provide our members with the best possible support, our Board has been divided into four specialist divisions: applied, entertainment research and education. 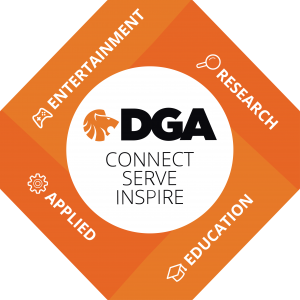 Each division has its own Division Manager, which brings its experience, broad knowledge, and extended international network to the DGA in order to serve, connect and inspire our members and strengthen its position. We play an active role in international committees and uphold close ties with the Dutch press where we act as a primary contact for the industry. Together we act as a first point of contact for Educational and Governmental Institutes, Embassies, Funding opportunities and Research projects. Dutch Games Association helps its members connect with each other and relevant parties for the industry on a (inter)national level. We support our members in order to have them achieve their ambitions and goals. Furthermore, we represent the needs of the Dutch games industry when issues arise that need addressing on a collective basis. We create new opportunities by contributing to and highlighting success stories from the ever growing Dutch games industry.